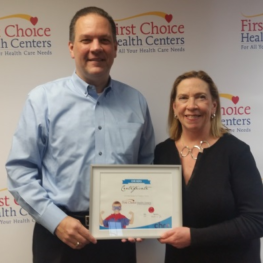 East Hartford, Conn. – After collaborating for many years to improve access to complete healthcare for some of the most vulnerable citizens in the state, CHR is honoring First Choice Health Centers as a “Hero” for the region. CHR is the state’s most comprehensive, non-profit behavioral healthcare agency with locations throughout eastern and central Connecticut. First Choice Health Centers is a non-profit community health center offering a full range of medical and dental services in 14 locations, including school-based clinics. The two agencies recently collaborated on an innovative federal grant to ensure that individuals with serious mental illness have access to quality behavioral healthcare and primary care services. This engagement led to First Choice Health Centers opening a full service medical office in CHR’s flagship outpatient building in Manchester. In addition, a nurse-practitioner from CHR is now seeing patients in one of the First Choice Health Centers offices in East Hartford. “Be a Hero” is the highest level of philanthropic support for CHR and includes a year-round partnership in advocacy and events including fundraisers, educational forums, the annual Health and Wellness Fair in Manchester and more. CHR is looking for more heroes to help sustain behavioral healthcare services for people of all ages who need expert care for depression, anxiety, addictions and many other services. To learn more about CHR and becoming a hero, please contact Maureen McGuire at [email protected]. About First Choice Health Centers: First Choice Health Centers’ mission as a community health center is providing integrated care is to break down the social and economic barriers to wellness and healthy living while extending the viable and productive lives of those we serve. Eugene Market, left, President and CEO of First Choice Health Centers receives certificate of appreciation from CHR’s President and CEO, Heather M. Gates.